How does the Alberta government balance the needs of energy and environment? The petroleum energy has traditionally emitted SO2 gas and other sulphur compounds into the atmosphere and regulations have been needed to minimize and control this activity. This long article summarizes many technical pages of the original regulatory documents. In October 1982, Amoco Canada had one of their wells blow out of control during drilling. It made headlines for at least ten weeks afterward while crews tried in vain to stop the huge flow 4200 thousand cubic metres per day. 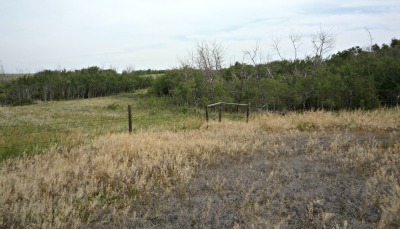 The extremely rich raw emissions containing 28% hydrogen sulfide gas (H2S) spewed from this crack in the earth, west of Lodgepole, Alberta, and polluted the air over much of the prairies. Two people died on site. Many new and revised safety regulations arose out of this event. Our modern AER Directive 60 owes much of its life to it. The directive regulates energy and environment, incinerating, venting and flaring releases in Alberta It protects public and environmental safety before potential dangers come into place. Directive 60 covers oil and gas companies and their activities such as drilling, testing, production, maintenance, storage, emergencies and cleanup, as well as the use of the common gas flare associated with each of these. The regulators are interested in seeing companies handle flaring in this order of priority: Eliminate, Reduce and Manage (by meeting so-called performance requirements and improving flare efficiency). Sometimes the decision-making flowchart includes obtaining public and regulator feedback as well. The AER provides assistance to proponents wanting to design a facility properly and communicate certain activities to the Board on an ongoing basis. Penalties for not doing so are delineated in AER Directive 19: Compliance Assurance. Hydrocarbons-rich gases dissolved in reservoir liquids start to come out of solution when the pressure in the underground reservoir starts to drop. Rather than wasting this so-called solution gas, the AER would want operators to use it wisely, and the Board provides energy and environment procedures for upstream petroleum operators to follow. What should you do if you were operating a regulated facility? Basically, make all attempts to reduce and/or eliminate flaring, incineration, and venting. This can often be achieved through conservation. What's that? The collection of solution gas for other uses, as fuel for other operations for instance. An operator is expected to do this if conservation can be deemed economically feasible. The AER, along with the Clean Air Strategic Alliance (CASA) have come up with these limits to continue their previously established trend of reducing flaring and its effects on the supply of energy and environment related resources. They say to limit annual flaring to 670 e6m3 (about 1836 "decks" per day on average). If needed, more drastic reductions may be imposed. If the gas will burn, it must be flared INSTEAD of vented. Any licensee flaring/venting at 900 m3/day or more must follow a certain procedure outlined in Figure 2 of the Directive and show the AER how each step was evaluated, and it boils down to the same recurring theme: Eliminate flaring and venting if possible, otherwise reduce this activity if possible. If neither is possible, then the performance requirements given in Section 7 must be met. Here's a special case. Many sites operating in the Wainwright-Lloydminster area may have to abide by these additional regulations (Check with the Board or Section 2.4 of Directive 60 for exact locations): Test-period solution gas flaring must be as short as possible, and not last for over 72 hours (However, they MAY allow exceptions). Conservation is to be implemented if the 900 m3/day threshold is exceeded, and operations shall be suspended until then. Even if sites are not required to conserve gas, they are still encouraged to do so if they can, for the benefit of energy and environment. Bitumen sites in this region can test flare for up to 6 months unless they exceed a 3-month average of 900 m3/day. Then they must conserve the gas ASAP, and must not exceed this maximum anytime during the 6 months after flow rate determination. AER repeatedly gives this advice to all of these sites (that is, single-surface lease sites with flaring/venting): conserve the gas if you can, even if the flaring rate is under the 900 m3/day. flared volume exceeds 900 m3/day and there is a house nearby (at a distance of 500 m or less). Rules are different for new houses going into the area after the battery has started opeartions; if this is the case, check with the Board. The economic ($50K) review must be done annually. Sites flaring less than the 900 m3/day may still need to take measures to conserve the gas if conservation is feasible. Occasionally there will be allowances if this does not work for an individual site; the licensee can make a case by filling out a decision tree, informing the Board and nearby residents of their intentions and complying with Table 1: Limitations and notification requirements for non-routine flaring, incinerating, and venting during solution gas conserving facility outages. in AER Directive 60. What is Clustering? Maybe operators can get together in an energy and environment meeting, combine their gas volumes and economically conserve the gas that way. They shall at least evaluate this possibility with industry neighbours less than 3 km away. Usually the biggest operator will initiate this action. A multi-well development (or equivalent) must consider this tactic for all sources of gas no matter how spread out the operations are, and this is to be included in the application under AER Directive 56 if applicable. What can sites do with the gas and its energy? Power generation is the most common choice. Going through the relevant regulations is quite simple for small (less than 1 MW) plants, and only a bit more complex for larger ones. How to Evaluate the Economic Potential for Gas Conservation. It's required. Operators can refer to sales gas prices, power generation or a handful of other economic indicators regarding energy and environment. The board will decide if they need to see the relevant documentation, and a response outlined in AER Directive 19 will be implemented if a site does not comply. You might want to check the details in Section 2.8 of Directive 60, but here is a summary. What energy and environment information does a site operator have to distribute to the public? Section 2.9 gives specific instructions. Any flaring, venting and incineration must be included in applications and appropriate public notifications. Nearby residents need to know about upcoming flaring or venting and have their concerns addressed. Any unusual flaring/venting activity will require notification to the AER , Alberta Environment and Sustainable Resource Development (ESRD) and nearby residents. contact information for the Board, ESRD and the company. Not all flaring or venting is planned. Of course, non-routine flaring is to be minimized in the same way as routine flaring; plants can contact the AER field centre for tips on how to reduce flaring during plant downtime. Often this can be done by use of prioritization if the elimination of flaring is impossible. Flaring of up to 2000 m3/day, for 5 days or less may be allowed in circumstances where equipment failures have occurred and restoration is underway. See Table 1 in Section 2.11 of Directive 60. Energy and environment rules for planned flaring are more stringent. A short period, less than four hours, would require operators to attempt to cut volumes by a half or more during this period, and if over four hours, the volume must be cut by 75% compared to average volumes over the last 30 days. The Board MAY allow exemptions. H2S content may not be more than 10% and nearby residents plus the AER field office must be notified, depending on the site-specific reporting requirements. Exemptions also apply to emergency events of less than four hours in duration. 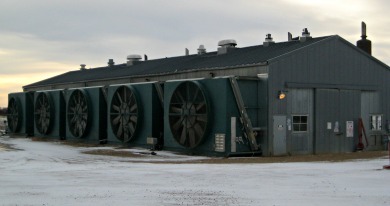 The AER considers plant upsets greater than four hours long in a more serious manner because of the implications for energy and environment. Not only do facilities have to reduce volumes by 75%, but they must not flare gases with greater than 10% H2S concentration, or hesitate to make the proper notifications outlined above, and there are occasional exemptions allowed once again. If flaring recurs too often, operators will have to conduct site investigations to fix the energy and environment problems. If the plant has its turnaround shutdown coming up, they can reduce flaring and venting for the duration of that event by exporting the solution gas to a neighbouring plant in operation, coordinating turnarounds for all facilities in the immediate network or even using temporary injection in place of flaring. If a shut-in would cause undue operator distress or equipment damage, other choices may be arranged with the AER, if justified and conducted at least 30 days before the shutdown. 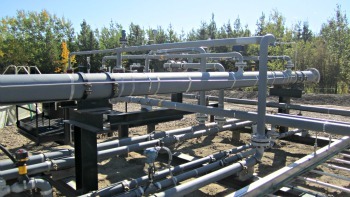 How are provincial royalties calculated on flared gas? See https://en.wikipedia.org/wiki/Alberta_Royalty_Review for further details. Royalties are assessed on flared gas if they are conservable in any way. To report solution gas flare activity, send data through the Petroleum Registry of Alberta. Operators must obtain a battery code and then use it to report production and flaring. The technical operations group provides submitted production data for viewing through the appropriate statistical reports, ST60 and/or ST60A. If a neighbouring entity wishes to include your site solution gas in their energy and environment conservation efforts, your site's cooperation is expected. Please give Barry J. Lough at Calvin Consulting Group Ltd. at 403-547-7557. What’s wrong with the energy and environment in Alberta? The province and its chief industry receive criticism in international news media almost every day. What is the truth? Find out here.